Kid friendly event...bring a lawn chair! "The GoodFellas, an American Beatles tribute band from the Washington DC area, have been together since 2011. Drummer Jon Sullivan, bassist Frank Murray, and guitarists Mark Loveland and Ray Futran have built up a sizable repertoire of Beatles’ tunes made up of an eclectic mix of early gems, B-sides, rarities, and of course, the hits. All of the band members share a very deep, lifelong love of the Beatles. While remaining generally true to the intent of the original , The GoodFellas toss in loads of energy, and deliver unexpected twists as well as an occasional dash of panache into their delivery of the music of the greatest rock band ever." "Since their formation, The GoodFellas have played numerous club dates, private parties and other events throughout the Washington, DC. area. The GoodFellas have performed at the "Abbey Road on the River" Beatles’ Festivals in both Louisville, Kentucky, and in Washington, DC. In December of 2012, The GoodFellas participated in a benefit concert in New York for the victims of Hurricane Sandy, helping to raise much needed funds to help in the restoration of some of the local communities hardest hit by Sandy. 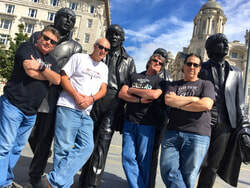 In February of 2014, The GoodFellas traveled to Florida to play a concert at a very large Senior Community, thrilling those many patrons who so vividly recall the original excitement of 1964"
"But The GoodFellas' crowning achievement was playing the "International BeatleWeek" festival in Liverpool, the Mecca for any band wanting to re-create the undeniable magic of the Beatles.....and they did that twice: in August of 2013, and again in August of 2016. The GoodFellas are extremely proud of their accomplishments thus far, and joyfully continue the work of expanding their repertoire of the greatest music ever created! ​ For the Fellas', It's Getting Better All The Time!"